Last evening I was reading in the Telegram how MassDOT would like to take a portion of Route 20 in Sturbridge, and Brimfield, and alter the lane configuration by excluding lanes. 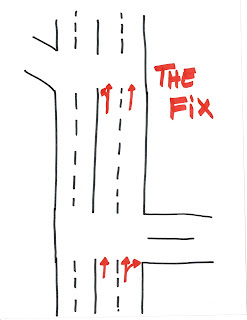 They propose downsizing the roadway from four lanes to two in order to add turning pockets and a bike lane. This would stretch a little over four miles from East of New Holland Road to west of Galileo Drive. 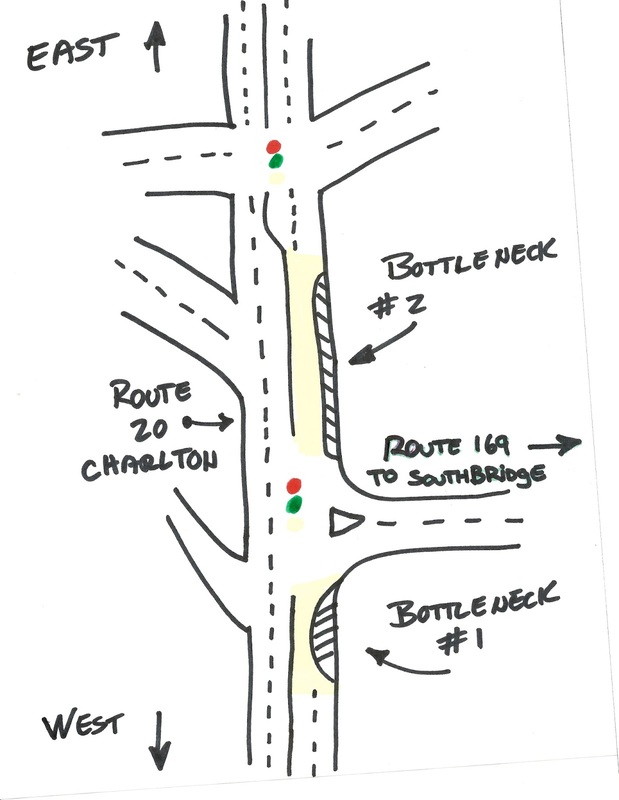 Blue route is the area that is to have traffic lane reconfiguration. As I read the article on my phone I stood up, and screamed, "OHMYGOD!! Don't let them do it!!" Scared the cat to death, and as of this morning she has yet to show herself. One of the biggest design mistakes ever to hit any department of transportation was the idea of taking away a lane of traffic and designating it for left, or right turns only. Well, it if a road was initially designed for four lanes of traffic, two one way, and two the other, it was because the traffic flow dictated it. Four lanes flows smoother than two, and when it comes time to take a left turn across oncoming traffic one just has to wait. Simple. And, when one has to take a right turn, one just does it when it is safe to do so. The whole waiting-our-turn-to-turn thing takes under a minute, but on average just a few seconds. Now, a turning pocket allows a driver to pull to the side, out of the way of the traffic behind him so as not to hold them up, and still wait their turn to make a turn. Hmm. The only thing that they are gaining is getting out of the way of the traffic behind them, and not holding them up, but they will unless the the lanes a kept at the same number, and the turning pocket is ADDED to the lane configuration. This configuration works great in front of the Hobbs Brook Plaza on eastbound Route 20. When one takes away a lane to facilitate easier turning it leads to a bottleneck. 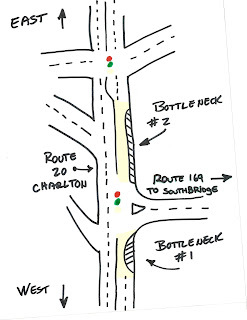 The drawing below is of Route 20 in Charlton at the intersection of Route 169. I have been trapped in traffic heading east in this area from Sturbridge for an hour. For one mile west of Route169, until just after the Route 20 / 169 intersection it has taken me anywhere from twenty five minutes to one hour to travel on my way to work. Now, there are a couple of factors that play into this delay. Most times I take it when the turnpike is bogged down, and it is barely moving. 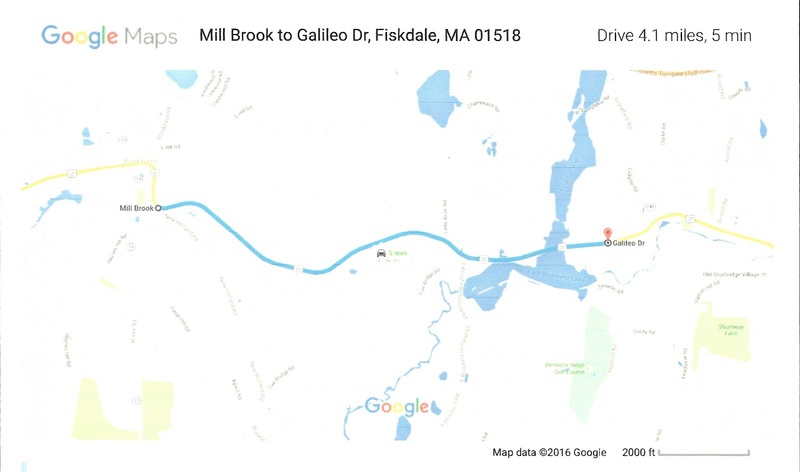 If is a recent delay, then my delay on Route 20 will be minimal, but if it is a long term delay on the Pike, then everyone else is thinking like me, and we are stuck in this debacle of poor planning which I have scribbled below. Whether there are traffic problems on the Mass Pike , or not, Route 20 should be free flowing at all times, and man made obstacles should not be part of the equation. Yes, traffic will run at a slower speed now, and again, but is should not be at a standstill on a regular basis. Cutting back to only one lane of east bound traffic in order for only a few cars to turn right onto Route 169, and creating a bottleneck of traffic that stretches far beyond Zorbras Restaurant far to the west is a design born in the mind of a silly person. There. I said it. A silly person. I know, strong language, but well deserved. And, to take the silly design even further, the designer kept the lane configuration at one lane even further east on Route 20 to allow vehicles to make a left turn at the next light. At the light. This is the very reason why God gave us traffic signals with little green arrows pointing left. I can't complain, or make a seemingly negative observation, without offering a suggestion that may be able to fix the issue, and this time is no different. I'll keep it simple. 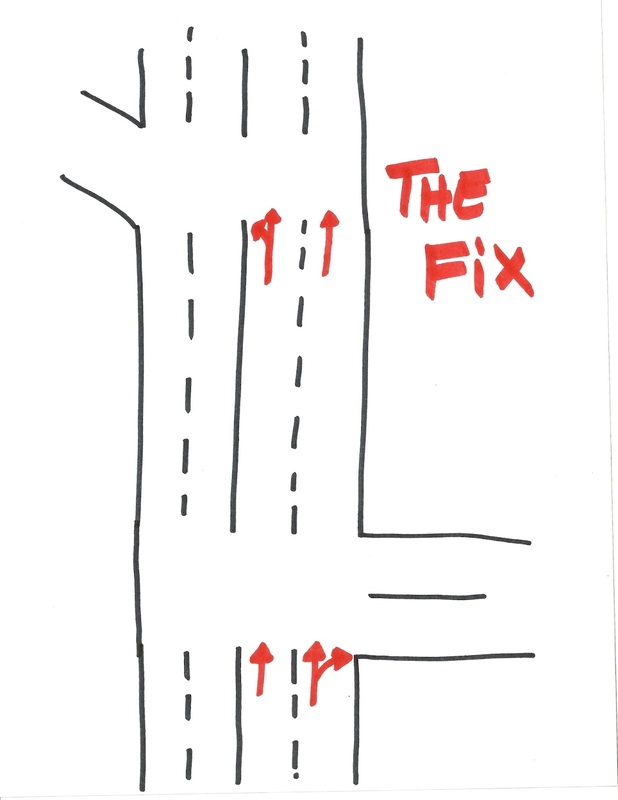 Remove the "turning pockets", and paint the appropriate directional arrows on the pavement like other intersections on Route 20. And, as far as those vehicles wanting to turn left where there are no intersections, well then, you will have to just wait your turn. Simple. I know that a vehicle wanting to turn left should not have to wait long to do so, and that it would be better for them to be pulled over a bit, but not at the expense of taking away a lane of traffic. Add the turning pocket to the existing configuration. Now, there is one other traffic design solution that is worth considering, too. In Wells, Maine, among other places, along Route 1, there are three lanes. The outer lanes are for traffic, and the center lane is for turning to the left. Traffic from either direction uses the middle lane, and it works. I imagine they use it here because land on either side of Route 1 is scarce for making an additional lane. A few years ago I wrote to MassDOT on their website, and mentioned the issues on Route 20, and 169. I never heard from them. Go figure. This time, I know Craig Moran, and the other selectman will make themselves heard to MassDOT, and maybe, just maybe, someone from MassDOT will read this as well. With all the traffic the Route 20 sees, especially during Flea Market season, it would be plain silly to alter the traffic configuration from what it currently is unless the number of lanes remained the same. There, I said it again. Silly.